Rid O Rock is a company that was created in 2003 with the idea of helping owners of all kinds remove rocks from their facilities. 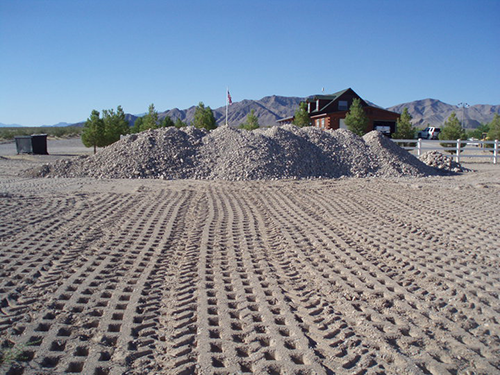 Specializing in rock removal for horse arenas, race tracks, fair grounds, pastures, fields, schools, and many other venues for the past several years has helped us more perfect the process and make it much more efficient. Being the Original horse arena rock removal company, we pride ourselves in the work that we perform. Always looking for new innovative ways to set the bar higher in quality, efficenty and customer service. The heart of the operation. On our machine we can run variouse sizes of screens dependent upon the needs of the customer. The standard size that we run is a 3/8". This means that it is going to remove anthing the size of a Pinto Bean and larger which greatly reduces risk of injury to horse and rider. We are the only known machine that actually screens a MINIMUM depth of 6" and has a maximum screening depth of OVER 12" Deep. Having this capibility means the quantity of dirt that moves over our screen in a givin area is much higher than our competitors. With this in mind, we have speen years researching the most efficent methods. This in return leaves the customer with dramatically lower costs and a much higher quality product in the end. A saying that we have had from the very beginning. We may do most of our services out in the Western states. We do make trips out to the east coast if we have enough work in that direction. Rid O Rock is a constantly growing company and we are always looking for oportunities to expand. If you are interested in Owning one of our custom build machines send us an email on the contact page and we will get back to you on the great opportunity that awaits you. Having been the first. We know the process better than anyone else out there and is what keeps us leaps and bounds ahead of the competition. A machine built from the ground up for one single purpose. Rock Removal. This is not a repurposed "Beach Cleaner." - Most options for screen sizes ranging from 1/4" - 1-1/4"
- Able to fit through most all 6' gates. - 3 cubic yard hopper. After all the screening is finished, we use our custom built harrow to spin off the arena knocking down all the inconsistancies, tightening up the arena, and creating a ride-ready arena surface that is ready to be enjoyed with no delay.